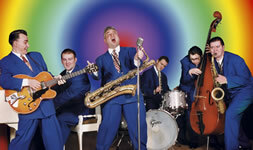 Rough, Tough and always Rocking, the legendary King Pleasure and the Biscuit Boys zany stage show sometimes belies the fact that here is the finest, most authentic Rhythm and Blues band ever to come from outside the USA. More than 1000 roof-raising live shows in little over 4 years. Successful - and repeated - tours through USA, Russia, Holland, Belgium, Germany, France, Switzerland and Norway. Show-stealing appearances at Jazz Festivals, Blues Festivals and even Rock Festivals. This is one of the liveliest attractions in the UK today and will continue to go from strength to strength. To download the above sound file(s), please "right click" the file and using the "save as" function, save the file(s) to your selected destination.